If you aspire to reach the pinnacle of the career ladder and to enjoy a level of financial independence, this page can help you reality check if you have the skills that employers most highly value, so that you can reach your goal in the shortest time frame. If your career objectives are finding the highest paying careers, hottest careers and careers in demand, you will also find this page relevant and helpful in your career research. The following thoughts are inspired by Automatic Wealth: The Six Steps to Financial Independence . Any employee who wants to earn an amazing income must move beyond being being a good employee to becoming an extraordinary one. Be considered an invaluable employee, someone who seems irreplaceable. Being a skilled worker is just the bare minimum; it is not enough. Your goal is to be of such worth that your company would rather pay you what you deserve than risk losing you to the competition. Of course, no employee is truly irreplaceable. But the point is this: the closer you get to seeming irreplaceable, the better your chances of radically increasing your income. To begin your journey to financial independence, you start by mastering a financially valued skill. A financially valued skill is one that an overwhelming number of people are willing to pay good money for. For discussion purposes, Michael defines “good money” as an income of USD130,000 a year. Compare your current job against this benchmark. Are you in the USD130,000 plus bracket or likely to get there in the next three years? If not, how else can you radically boost your income? Here are three solutions to help you accelerate your path to the top. You may rise to the top of your profession by working harder and outperforming everyone. But if your job description is not a profit generating one (e.g. sales, marketing, product creation, copywriting), there will always be a ceiling to your earnings potential. you will have the best chance of massively increasing your income. In summary, to earn a super income, be a super contributor to your company’s bottom line. In short, if you are not currently involved in a profit producing role, start working to acquire a new career occupation description. Guess which one of the following skills will most help you become wealthy. All these skills are important and useful in helping you to become a star employee, but they do not aid you in accomplishing your financial goals. The ONE skill that most directly impacts on your wealth building ability and future financial independence is the ability to sell. Selling is at the core of all commercial activity. Every for-profit enterprise survives or fails according to whether its sales skills are first grade. Now, I know for most people the word ‘selling’ is like a nasty smell that you want to get rid of quickly. It brings to mind telemarketers, doorknockers, insurance agents and real estate salespeople. How are your sales skills? Would you say they are 1st grade, 2nd grade or 3rd grade? If you do not know how to sell, or have always shunned selling as something for ‘others’, it’s time to face up to reality. This is one of the basic life skills that you simply cannot afford not to master. Selling skills, and by extension, marketing skills, are must-haves if you want to bring your efforts and your products and/or services to the notice of your boss and your target market. So get moving. Start volunteering for sales training courses when you next submit a business skills training request. To sell is to exchange goods or services for money. But selling also has a secondary meaning: to persuade or induce someone to buy something. When you think about it, selling is intrinsic to how we communicate with others daily. You are selling when you assure your child that eating vegetables or tidying up after herself is what Barney wants her to do. You are selling when you explain to your skeptical husband that your new $500 gym membership will give you more energy so you can keep on top of the chores and kids. I didn’t enjoy the advantage of studying sales and marketing when I was a law student. But sales and negotiation training are clearly just as important as learning tort and contracts. After all, a successful lawyer career isn’t limited to making partner in a large law firm or becoming a superscale officer in public service. How will you build a thriving law practice if you do not know how to attract, retain and increase your customer base? If you find the idea of selling a challenge and want direct sales tips from experts on how to address the gap in this area of your business and career training, read on. You can sell without compromising morals or ethics or setting yourself up for sleepless nights. The key is to ensure that what you deliver is as good as or even better than you say it is. That is, underpromise and overdeliver. This is simply ethical decision making. There are two business skills training resources I want to recommend that are perfect introductions to the world of selling. The first resource I recommend is Michael Oliver’s Natural Sellingmethod. His intended audience is network marketers and direct sellers, but his sales skill training approach works just as well for anyone in a sales job, or who simply wants to improve her sales and negotiation skills.Michael’s sales training program comprises a home study course, books and audio resources. They are a great way to invest in a vital aspect of business skills training at your own pace. The second business skills training resource I invite you to explore teaches you the vital skill of PREselling.It’s called PRESelling because it comes “pre” i.e. before the closing sale. 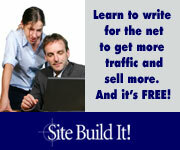 The master of PREselling is Dr. Ken Evoy, founder of Site Build It!. He has written a number of easy-to-read classics that are of enormous value to any success-minded person. Right-click on the images to download your copy and begin reading. He will serve before kings; he will not serve before obscure men. they don’t take a back seat to anyone.